Serious Apple computer users now have a credit card that rewards them with 3 points for every $1 spent on the web with store.apple.com, an Apple Retail Store, via phone at 1-800-MY-APPLE or the iTunes Store. As a one-time welcome to the Apple family of products new account holders get two $25 Apple Store Gift Cards or App Store & iTunes Gift Cards after first use of the card. Besides Apple purchases, cardholders receive 2 points at restaurants, and 1 point on all other merchandise bought with the Barclaycard VISA with Apple Rewards, which they receive in the form of an Apple or iTunes gift card. Owning an Apple product or getting your favorite iTunes was never more affordable. Upon approval of the Barclaycard VISA with Apple Rewards, cardholders also receive a generous 0% financing promotion on purchases made at Apple within the first 30 days of account opening to make owning an Apple product easier on the budget. As a note, this 0% financing offer does not apply to iTunes purchases as they are not deemed to be qualifying Apple purchases under this offer and it is available only to new applicants. Caution: If this credit card account is inactive for 6 billing cycles in a row, i.e. no balance, no payments and no transactions, it may be terminated and you will lose all your Apple rewards! As a convenience there is no need to manually redeem the Apple points, because when the cardholder accumulates 2,500 points, he or she will automatically receive either a $25 Apple gift card or a $25 iTunes® gift card following the next month’s billing statement. Read the terms and conditions of the Apple Gift Card to avoid any hassles with it, such as it may not be redeemed at the iTunes Store, at any Apple resellers, etc. Note that the account will initially be set up to receive Apple gift cards as the default. Cardholders have the option of changing the default Apple gift card to a $25 iTunes gift card by contacting the customer service phone number on the back of their card or by visiting BarclaycardUS.com and selecting the View rewards tab. 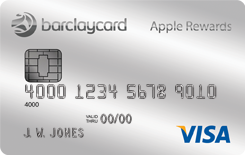 Apply here for the Barclaycard VISA with Apple Rewards and read the FAQ’s of the card carefully for details of its use. Forgot your card? No problem. Use your iphone with the ApplePay app at checkout! San Francisco 49ers credit card holders receive 10,000 First Use Bonus Points after spending $500 or more with their new card within the first 90 days of account opening. The rewards continue after the introductory period with a generous 2% reward on 49er and NFL purchases, or a 1% reward on purchases elsewhere. An introductory balance transfer of 0% financing for 15 months is available subject to a nominal fee of 3%. Transferred balances don’t receive any reward points and the transfer fee is deducted from the amount transferred. The official credit card of the NFL, the Extra Point Credit Card from Barclay Bank, entitles fans to buy 49ers and NFL gears at a whopping 20% discount compared to people using other cards on purchases at the NFLShop.com. Exclusive to 49ers credit cardholders, purchases for game or season ticket over $500 can be gotten with zero percent financing for up to six months. Show your support for the San Francisco 49ers and be rewarded in return for your loyalty by applying here. Call 866-918-5212 Monday through Friday 8:00 a.m. to 5:00 p.m. ET for details on the SCRA terms and condtions. Important note though, SCRA does NOT relieve cardholders from making credit card payments on time and any penalties or fees from those obligations! Get rewarded with 2 points per $1 spent on NFL and Carolina Panthers purchases, such as eligible game tickets, items in the official Panthers pro shop and in the stadium itself on game day. Earn 1 point per $1 on all purchases made with your Carolina Panthers credit card everywhere Visa is accepted. As the official credit card of the NFL, Extra Point members are entitled to a generous 20% savings on purchases made with their Panthers credit card at NFLShop.com. Show your support for the Carolina Panthers this season and be rewarded in return for your loyalty by applying for their Panthers Visa Signature credit card. Now as part of the BarclayCardUS network, Carolina Panthers credit cardholders can shop with the convenience of their iPhone using ApplePay. Erase high-interest credit card with an introductory balance transfer offer of 0% APR for 15 months, on transfers made within 45 days of account opening a 3% transfer fee applies). The rewards feature with 2 points per $1 spent on game tickets, the Atlanta Falcons pro shop, the stadium itself on game day. Cardholders earn 1 point per $1 in net purchases everywhere Visa is accepted. Points can be redeemed for exclusive Atlanta Falcon game tickets, VIP Experiences, authentic NFL merchandise available only with the Extra Points card, or statement credits starting at 2,500 points (good for $25). The more you spend, the more you get. The official credit card of the NFL, Extra Point members are entitled to a generous 20% savings on purchases at your Atlanta Falcons store and the NFLShop.com. Now as part of the BarclayCardUS network, Atlanta Falcons Visa members can shop using their iPhone using ApplePay.